Yeah, this is one of those projects that was aided by the Obama administration’s frequently criticized loan guarantee program (a program, by the way, that actually has its roots in the George W. Bush days). While most people think of the Solyndra solar manufacturing debacle when they think of the loan program, the fact is nearly all of the projects it supported -- and all of the ones to build power plants -- are succeeding as planned. Still, the loan program became so weirdly politicized that last year, the House GOP tried to enact a law called the “No More Solyndras Act.” Here’s a funny thing, though: The same law that brought us Solyndra brought us Mesquite Solar 1, and now that it’s on-line, at least one prominent Republican and frequent critic of the president thinks it’s pretty cool. So in the end, construction of Mesquite Solar 1 almost certainly won’t cost taxpayers a cent, since the $337 million in loans that the U.S. backed will likely be paid off, as the plant uses free fuel -- sunlight -- to crank out electricity, which will be sold to Pacific Gas & Electric under a twenty-year agreement. 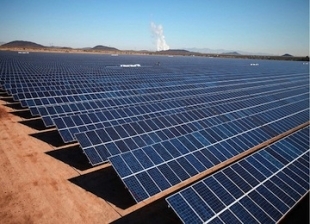 Sempra wants to expand the power plant, too: “Future phases planned at the solar complex could produce up to 700 megawatts, making it one of North America’s largest solar power installations,” the company said.